Audi has just announced that it will be offering customers a vehicle to compete with stuff like the Lamborghini Gallardo Superleggera, the Porsche 911 GT3 RS and the iconic Ferrari Scuderia. While it may be a bit late to join this club as all these cars have been around for quite some time now Audi believe that their stripped out track car is a genuine contender. 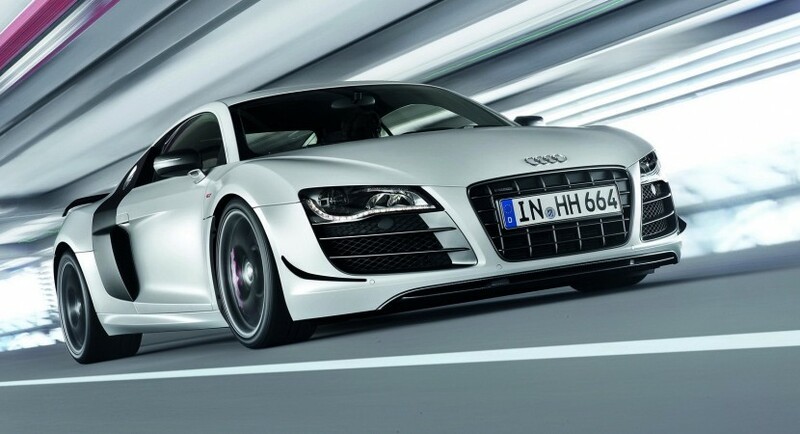 The Audi R8 GT is based on the 5.2 liter V10 engined version but now the power has gone up to 560 horsepower and nearly 400 lb-ft of torque at 5600 rpm. As is the case in most of these cars the engine power gain isn’t that much, 35 horsepower and 7.4 lb-ft won’t make you get out of the normal R8 and into this one and notice a massive difference in power. 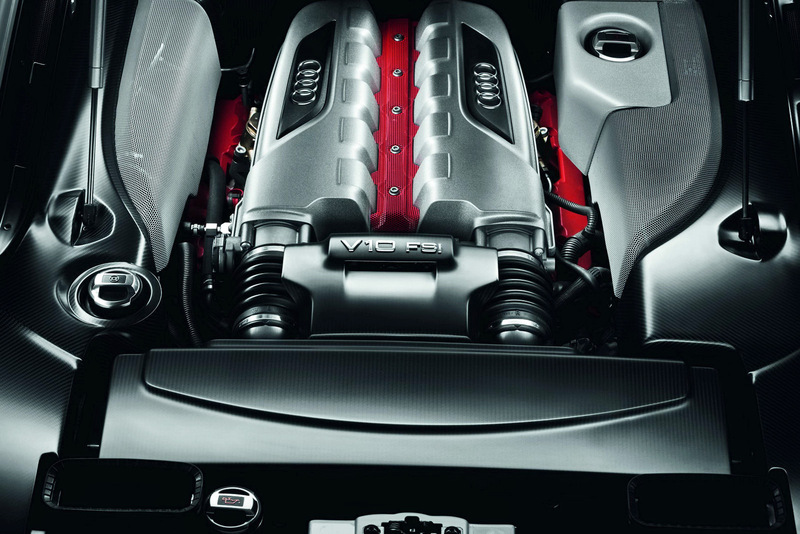 Where you will notice the difference is in how the new more powerful engine will shift the lighter car around. 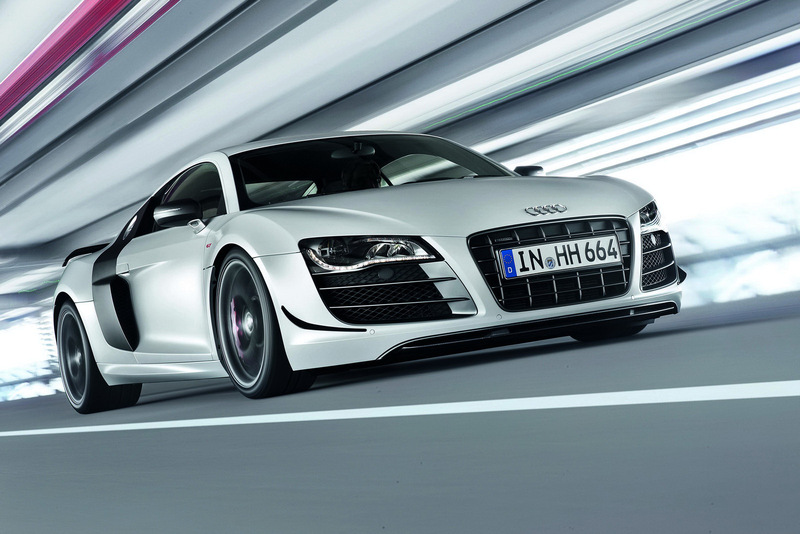 The weight saving program totals up about 220 pounds with the new Audi R8 GT weighing in at 3,362 lbs. The list of changes includes new settings to the ESP system, a redesigned power relay via the 6-speed R tronic sequential manual transmission and through some changed axle settings. As befits such a model there’s some aerodynamic work done on the body as well which, to my mind seem to take a bit off the looks off the standard car. In case getting to 62 in 3.6 seconds and a top speed of 199mph gets you a bit emotional you can always rely on the updated braking system with carbon fiber ceramic brakes that measure 380 millimeters in diameter up front and 356 millimeters at the rear, with red anodized aluminum calipers. Thinking of getting one? Well it’ll set you back just a little more than a quarter million dollars and you’ll need to make up your mind fast as only 333 units of the Audi R8 GT will be produced.